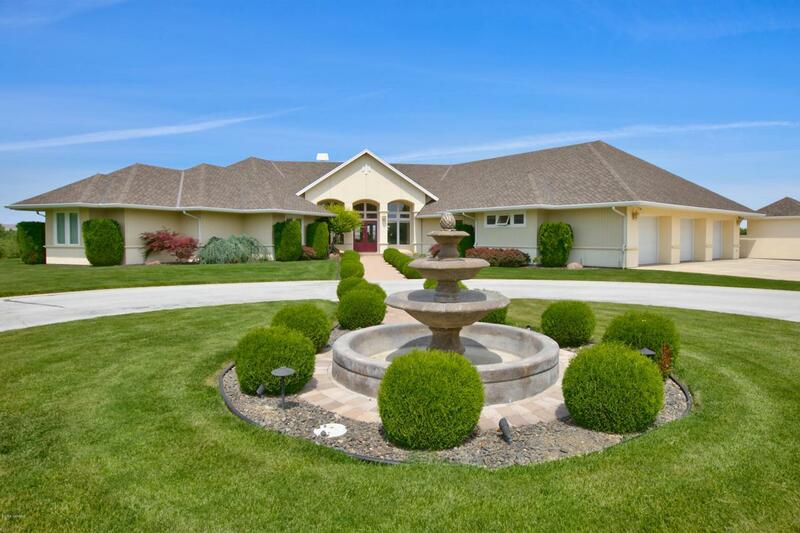 Tucked down a private orchard-lined lane, through the gated circular drive find this custom designed home masterfully built by notable Yakima builder, Richard Cuyle. The formal entry with marble floors features lofted ceilings, and a first glimpse at the large light filled spaces. The home opens with a true feeling of substance. The formal living room, poised for large gatherings, opens onto the expansive back patio with orchard views is open to the oversized dining area, complete with fully equipped butlers ''station'' and wet bar. The large kitchen is thoughtfully designed for both entertaining and daily living with two kitchen islands, double oven's, oversized refrigerator, eat-in dining area, and is open to the ''everyday'' living areas, More...including the informal living space and outdoors. Just steps from the kitchen find a built-in "life management" station, perfect for dropping keys, organizing daily life, or sitting down for an email. The large mudroom features a full bathroom and access to the oversized and climate controlled 3 car garage. On the opposite side of the home, find a long private hall leading to 2 of the homes secondary bedroom spaces, one with walk-in closet and en suite bath, and the three piece master suite featuring detailed ceilings, a private den space with gas fireplace, and well-appointment bath with marble finish work. Downstairs find equally impressive space with 9 foot ceilings and thoughtful design. The large living area is perfect for crowded movie nights and features an additional kitchen/wet bar area, a large 4th bedroom & full bathroom, and two substantial storage rooms. Additional features include custom outdoor living room with the large covered patio complete with floor to ceiling stacked stone fireplace, fully wired speaker system inside and out, custom built pool and spa, full wrought iron fencing enclosing the large backyard green space, orchard and territorial views, close proximity to Apple Tree Golf Course, West Valley Schools, and local amenities.